The P4A team has reached out to several of it larger Patch Remedy customers to see how they fared against the WannaCry Worm that struck across the globe with vengeance last week. We found that MSPs that had Patch Remedy deployed and managing the WUA updates for their clients were not effected by the recent outbreak. Why were Patch Remedy MSPs so lucky? Simply said, We keep the WUA up to date which keeps your patching working and up to date across your Windows devices. Keeping Windows patched keeps you safe from known exploits like the WannaCry Worm. Numbers released by Kaspersky Lab on Friday reveal that over 98% of all documented WannaCry infections were running versions of the Windows 7 operating system. Out of all Windows 7 users, the worst hit were users running Windows 7 64-bit edition, accounting for more than 60% of all infections. MSPs that were using Patch Remedy as part of their maintenance processes were less likely to have Windows 7 systems not current on patches or at least on the latest rollups for Microsoft. Windows 7 is still by far the most common version of Windows, running on roughly four times as many computers as Windows 10 worldwide. 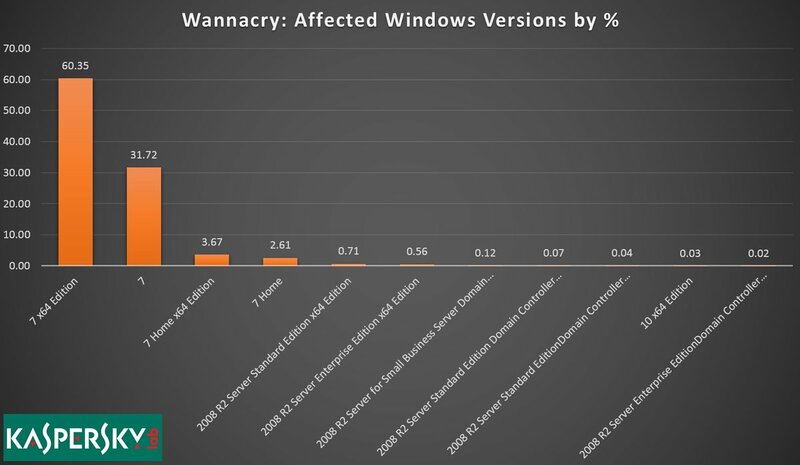 Since more recent versions of Windows aren’t vulnerable to WannaCry, it makes sense that most of the infections would hit computers running 7. Visit Patch Remedy for more information on how you can better protect against known threats.